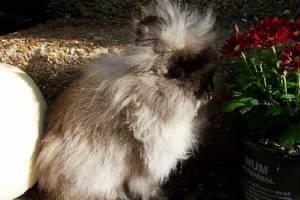 My daughter has decided not to show rabbits anymore, therefore I must sell out of the netherland dwarfs. I have three REW's-the buck is granded, and I have a doe from him. I have a granded siamese sable buck, and another doe. I would like to sell them together, but will sell them seperately if necessary. I have three REW jersey wooly kits, I have not sexed them, but they are 20.00 each. I will have pictures soon, but my digital camera broke, and I am in the process of purchasing another.